You guys! It was 70 degrees yesterday! 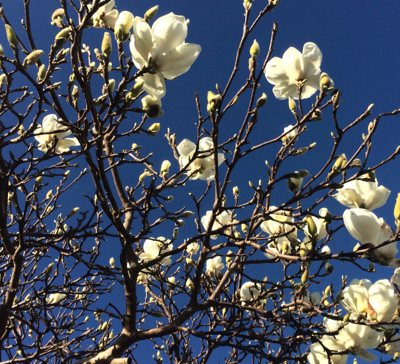 Above you see the magnificent magnolia in blossom outside the library on Friday afternoon, when it was a mere 65 degrees. Last night, I slept with the balcony door open. It is February, isn’t it? I stopped at the post office on my way to work one day this week (I was also the wino fairy, dropping off the unopened giant jug of cheapo red wine someone brought to Christmas dinner outside the Gro, undoubtedly to someone’s delight) and discovered that they had just installed a bank of new parcel lockers next to the old one. But apparently not for me, since I found two yellow slips inside my post office box. The delivery problem is especially annoying since Amazon refused to ship to my PO box in the first place, forcing me to use the street address where I do not receive mail. Last weekend, my landlord Mark turned up with a letter marked “extremely urgent” and a postmark of over a year ago. This is why I have a PO box. Often things that are directed to the street address end up at the PO anyway, like these packages. I expected one of the packages to contain a DVD among more mundane things, which although mundane, are not readily available in our little corner of the world. When I finally got my hard-won packages, I was displeased to note that it did not include the DVD, though everything else was present and accounted for. Looking up my account on Amazon, I discovered that I had, in fact, failed to order the DVD along with everything else. So its absence was entirely my fault, and you know how I hate it when I have no one to blame but myself. I rectified my ordering error – and had the new package delivered to my PO box – and grumpily went to open the second package. Imagine my surprise to find it was a beautiful book sent from a dear friend (and wonderful writer) in Alaska, containing several of the articles he had written. My grumpy mood vanished as quickly as it came, and I have hours of happy reading ahead of me. A YEAR AGO: A delightful day with the most delightful girls. FIVE YEARS AGO: An avian intruder. TEN YEARS AGO: The surreal water bill. Wow. the weather is nice in your part of the woods, was we say. Yes, it’s still February down her and the weather has been showing it. We have had snow storm after snow storm and when we don’t it’s cold as heck, lucky you. Sorry to hear of your mailing problems but looks like your PO box is working ok. Don’t blame yourself too much about the CD, it happens, have a great week. Sheesh. Enjoy the springlike weather. -18 with the wind here today.